Summary THE BFG is a fantasy adventure in which a young orphaned girl is carried away to a magical land by a big friendly giant. 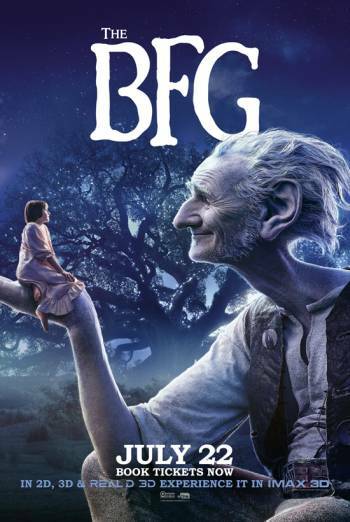 THE BFG is a fantasy adventure in which a young orphaned girl is carried away to a magical land by a big friendly giant. There are occasional scenes of mild threat in which a young girl hides from giants who are intent on eating her. This includes a brief sequence in which the girl has a nightmare in which she is dropped into a giant's mouth, but she then wakes up unharmed. There are infrequent scenes of very mild violence, including some large giants bullying and throwing around a smaller giant, and a scene in which the latter touches a red-hot poker onto the bottom of one of his tormentors. Infrequent scenes of toilet humour feature characters farting after drinking a fantastical liquid.